The story of Andrew Richmond is one which is bare of much detail. We know that his father was a farmer, the tenant of Parkieston farm. In June 1679 Richmond was apprehended by John Graham of Claverhouse and his dragoons. He was not allowed any form of trial, and the soldiers under Clavers had him shot dead. The gravestone in Galton churchyard famously depicts Richmond pointing at the Bible whilst Graham of Claverhouse is taking aim at him with his gun. 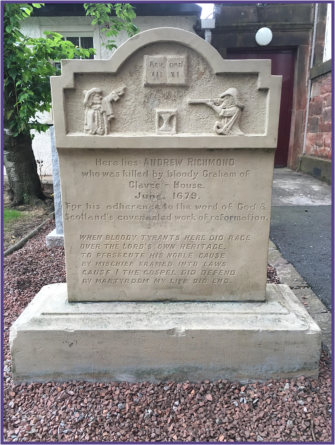 Andrew Richmond's stone is located to the side of the parish church, near to the church hall door. It depicts Claverhouse aiming at Richmond with his gun. The memorials here were restored by the SCMA in 2016.